WATERLOO – Acclaimed journalist Chantal Hébert and Canadian entrepreneur Peter Brown will receive honorary degrees at Wilfrid Laurier University’s fall convocation. Laurier will hold its fall convocation on the Waterloo campus Oct. 29 and 30 while the university’s Brantford campus will host its first-ever fall ceremony Nov. 3. Laurier’s Brantford convocation will hear remarks from guest speaker Tanya Stephens (BA ’03), one of Laurier Brantford’s earliest graduates and currently a lawyer at Boddy Ryerson L.L.P. The ceremony will also celebrate the first graduating class of the Business Technology Management (BTM) program. Peter Brown is an entrepreneur, philanthropist, and founder and former CEO of Canaccord Genuity Group. Under Brown’s leadership for 38 years, Canaccord became the largest non-bank investment dealer in Canada and boasts a market capitalization of $1 billion. Brown currently serves as chair of the board of directors of The Fraser Institute and chair of the Vancouver Police Foundation. He is also on the board of governors for the Business Council of British Columbia and is a member of the Economic Advisory Council for the federal Department of Finance. For his exceptional leadership, Brown earned the Entrepreneur of the Year Lifetime Achievement Award, was inducted into the Canadian Business Hall of Fame, received the Queen Elizabeth II Diamond Jubilee Medal, and is a member of the Order of British Columbia. He is also a leader in the community. Through his foundation, the Peter & Joanne Brown Foundation, he supports children, arts and local charities. As an experienced business leader, he supports Canadian entrepreneurs by sourcing capital and sharing his expertise. Brown has also demonstrated a commitment to Laurier alumni and has actively recruited Laurier graduates over the years. He will receive an Honorary Doctor of Laws degree Thursday, Oct. 29 at the Waterloo Memorial Recreation Complex at 2 p.m.
Chantal Hébert is an award-winning journalist, author and political commentator. 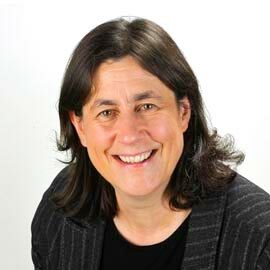 Hébert has spent four decades covering provincial and federal politics for various news outlets, including CBC’s Radio-Canada, as a parliamentary bureau chief for both Le Devoir and La Presse, and in her current role covering national affairs for the Toronto Star and serving as a columnist for Le Devoir and L’Actualité. She has also been a weekly contributor to the “At Issue” panel on CBC TV’s The National since 2001. Hébert is the author of French Kiss: Stephen Harper’s Blind Date with Quebec, and co-authored, The Morning After: The 1995 Quebec Referendum and the Day that Almost Was. Hébert is dedicated to accurate reporting and her work reflects the highest standards of professional ethics. She is the recipient of the 2005 APEX Public Service Award, the 2006 Hyman Solomon Award for Excellence in Public Policy Journalism and York University’s Pinnacle Achievement Bryden Alumni Award. In 2014 she won a National Magazine Award (Gold) for her column in L’Actualité, and her book The Morning After won the QWF Mavis Gallant Prize for Non-Fiction. Hébert was invested as an Officer of the Order of Canada in 2012. She will receive an Honorary Doctor of Letters degree Friday, Oct. 30 at the Waterloo Memorial Recreation Complex at 2 p.m.